It’s very rewarding to preserve your local history and provide access to it for your community, and we love it when CSL can help make this happen. On October 12th, the Louisville Public Library celebrated a major win within their community – the digitization of more than 66 years of the Louisville Times newspaper – the paper that captured the daily history of Louisville, Colorado. The Louisville Public Library, the Louisville Museum and the Louisville History Foundation all held an open house to commemorate the event. Thanks to funding by the City of Louisville, the Louisville Times issues from 1942 to 2007 , plus a few predating that period, are now accessible online 24/7 and keyword searchable through the Colorado Historic Newspapers Collection (CHNC), a service of the Colorado State Library. Visit the CHNC Louisville Times archive at www.coloradohistoricnewspapers.org, to explore this title in the database. The open house was a great event. About 35 people gathered for the launch party to celebrate the new availability of this newspaper that contains so much of Louisville’s community history. Among the attendees was Dean Lehman, who arranged for the donation of the newspapers to the City of Louisville in 2014. 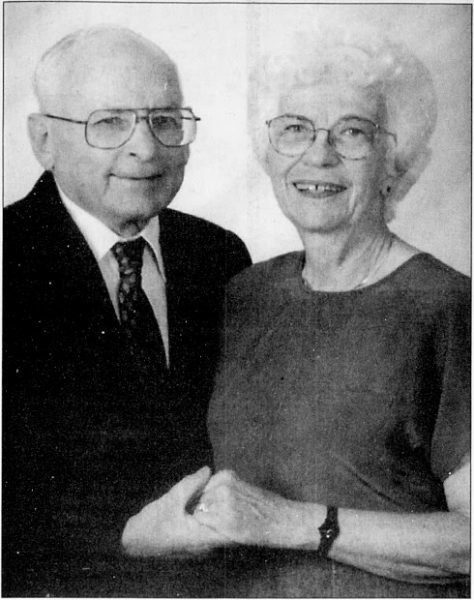 Percy and Carolyn Conarroe of Erie observing their 50th wedding anniversary July 15, 2000. Taken from the Louisville Times, Volume 86, Number 29, July 19, 2000. In attendance at the event was Carolyn Conarroe, who with her husband Percy, ran the paper from the 1960s to the 1990s. Their son Doug, and daughter, Cynthia also came, along with former Louisville Times employees Jeff Thomas, Donna Wicks, and Becky Schreiter. Regan Harper, Director of Networking and Resource Sharing for the Colorado State Library was present representing the team of State Library staff , especially project manager Leigh Jeremias, who have been instrumental in getting the newspapers digitized and accessible as part of the Colorado Historic Newspapers Collection. Prairie Mountain Publishing gave permission as the copyright owner for the newspapers to be digitized. The Louisville History Foundation supplied plenty of delicious food for the evening. We have already heard several accounts of people finding information in these newspapers that they have been looking for. For example, former Louisville Fire Chief Chris Schmidt said that he was able to use the digitized newspapers to fill in gaps about the history of the Louisville Fire Department, while Kaivi Kumar came to thank the City for making it possible for her to locate the news item about her son being “Citizen of the Week” back in 2004. Several people mentioned that they were able to fill in family history information as a result of articles that they have found. The digitized newspapers were immediately of help to Bridget Bacon, Louisville Museum Coordinator. It took her only about a minute of searching to find an article that gave her the information that she had been looking for regarding the year when the neon Blue Parrot sign was originally installed in Louisville. She also located information about two servicemen with strong Louisville connections who were killed in World War II. Much to her surprise, the Museum didn’t have information about them before. Check out the Louisville Times online along with over 220 other titles available through the Colorado Historic Newspapers Collection. This post was adapted from the an article from The Louisville Historian (Issue 116, Fall 2017), a publication of the Louisville Historical Museum, Louisville History Foundation, and Louisville Historical Commission. Thanks Bridget Bacon for sharing it with us.